Have you ever been in a Pilates class in which you were in quadruped position on your hands and knees, and before the instructor can say “just ten more…” your wrists are screaming in agony and you have to change positions because it feels like your hands will fall off? Ok, maybe you’ve experienced a less dramatic version of this tragic fate, but you might have wondered…”why does this feel so uncomfortable for my wrists?” and “how can I get rid of this sensation and feel stronger?” If these thoughts have crossed you mind, you are in luck, because in this Give Yourself a Hand series of ShopTalk, we will get you acquainted with your forearms, wrists and hands. Imagine the following activities: throwing a ball, swiping your credit card, knitting a sweater, playing the guitar, giving a “high five” to your teammate, pouring a pot of tea, drinking your morning java, texting a friend, holding a baby, petting a kitten. These and countless other activities, both monumental and mundane, would be unimaginable without the smooth, coordinated and healthy movement of the structures of your forearms, wrists and hands. These parts of our body are often overlooked in our regular exercise routine, but can affect our whole life if they are not working optimally. As a physiotherapist, I’ve seen many clients derailed and frustrated because they have hurt their thumb or their wrist and can no longer grip even an empty glass. Hand and wrist injuries can be caused by a variety of factors, most commonly from strain or overuse (such as too much typing on a keyboard with improper hand and wrist position), sudden extreme force (such as a fall on an outstretched hand), or disease (for example, rheumatoid arthritis). Regardless of the reason why we get pain and dysfunction in the wrist and hand, part of the recovery usually involves strengthening tissues that are weak, and stretching tissues that have become tight. In this instalment, we will begin our exploration at the forearm and wrist. We will look at the general anatomy and then see simple yet effective exercises that can help strengthen or release these structures, depending on your needs. The forearm is the part of the lower arm from the elbow to the wrist and contains two long bones, the radius and the ulna. 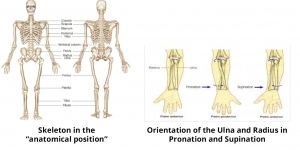 When standing in the “anatomical position” (see skeleton below), the ulna is the long bone closest to the body and the radius is the long bone that runs along the thumb-side of the forearm. 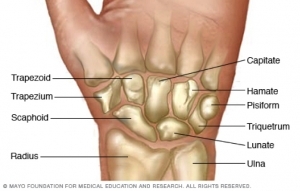 The lower ends of these two bones connect with the top row of wrist bones, or carpals. The forearm bones are important for our purposes because they help to position the hand and wrist so that we can use our hands. For the palms to be turned up (supinated), as in holding a cafeteria tray, the radius and the ulna stay in their anatomical position. But to turn the palm down (pronated), the radius must rotate around the ulna. Also, the radius and the ulna are attachment points for the muscles that, via long tendons, move our fingers. If these muscles are not doing their job properly, this can lead to wrist and hand problems. Conversely, if we had an injury to our wrist or hand and cannot move these lower structures, the muscles of the forearm will get weak and dysfunctional from lack of use. These muscles can get fatigued from overuse (such at typing on a keyboard, playing a musical instrument, doing racquet sports) or can get strained from a fall onto the hand. As mentioned a moment ago, the radius and the ulna end at the wrist, where 8 small bones converge to allow the wrist to articulate with amazing range of motion and precision. 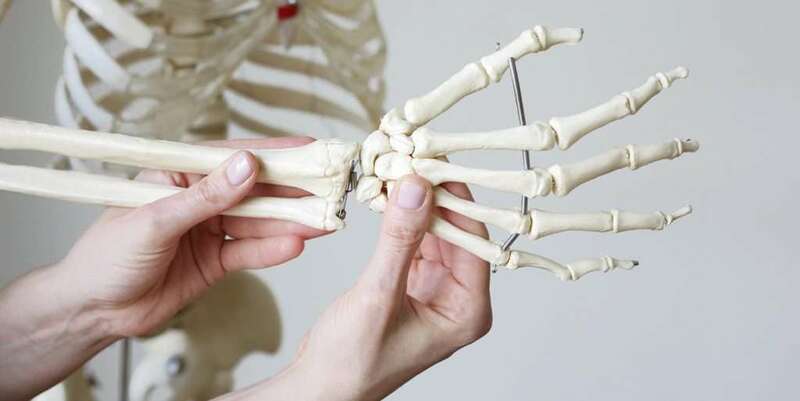 It is because of these little bones and joints and the way they move together, that we can angle our hand up, down and angle it toward the thumb or toward the pinky finger. If you watch a flamenco dancer’s hands and wrists in action, you can start to understand the incredible intricacy of movement possible at these joints. At the same time, the wrist needs to be strong and healthy for actions like lifting heavy objects, picking up heavy pots, and doing push up and pull-ups at the gym! The eight carpal bones are connected to each other with ligaments that together, form an arch that is concave towards the palm. This arch or tunnel houses the tendons that move the fingers, as well as the median nerve. If this tunnel gets compressed, carpal tunnel syndrome develops. Another very common injury is a fracture of the end of the radius, often called a “FOOSH”, a Fall On the Outstretched Hand (this really is the short term, not just some cute Nike “swoosh” sounding action terminology). With this type of injury, the forearm, wrist and hand are all affected by swelling, pain and weakness and often the three nerves that travel down into the hand can also be affected. On the pinky edge side of the hand are the hamate and the pisiform bones, which are important structures in the proper functioning and sensation of the pinky finger and part of the 4th finger. The ulnar nerve is tucked in a canal between the hamate and the pisiform, and if these carpal bones become compressed or misaligned, this can be a cause tingling or numbness in the last two fingers. There are numerous other examples of how the carpal bones in the wrist can affect our hands, but the important thing to remember is that we want a balance of strength and appropriate length in our forearm muscles and smoothly moving forearm and carpal bones. Please stay tuned for next week’s instalment, in which we will explore some simple exercises for keeping your forearm muscle strong and supple, and your wrists moving with ease. We will incorporate some very simple items that you have in your home.